Our aim is to make great wine, with the preservation of nature’s flavours, complexities and balance in our wines by using minimal intervention in our vineyards and in the cellar – to allow the individual vineyard’s “terroir” or sense of place to express itself by ‘interfering’ as little as possible. Our wines are grown, made and bottled entirely on the estate from our own grapes, using organic principles. We produce our own composts and have never used synthetic chemicals on either the vines or the soils, since our vineyards were planted in 1975. 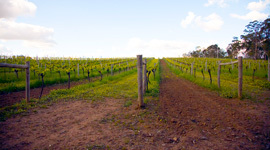 Viticultural practices are simple: own rooted vines (ie. not grafted on to American rootstocks to confer Phylloxera resistance), no irrigation whatsoever, minimal tillage, natural inter-row mulching leading to broad bio-diversity, very low yields giving depth and intensity to our wines. Only hand pruning of the vines and hand harvesting of the fruit can allow us the human connection to our living soil. 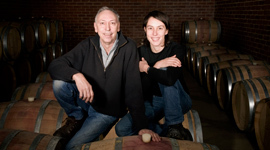 With more than three decades behind us and many accolades for our wines, Jasper Hill has become synonymous with Heathcote, shiraz wine in particular, and is regarded as one of the pioneers of this relatively new and exciting wine region. 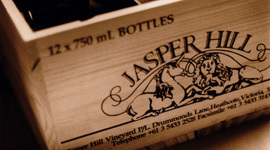 The Jasper Hill wines are released in August, with the release weekend the final weekend of that month, from 10am-5pm. The rest of the year, our cellar door is open by appointment – please phone or email to arrange a visit.